4-4-2 is the way forward. Despite the result reading only as a draw, the performance against Forest was the best since opening day from this beleaguered Leicester City squad. With Sven Goran Eriksson intent on playing a 4-3-3, despite the breadth of choices he has in midfield, this was a much better system which rewarded him with a team that controlled large periods of the game. More of the same please, Mr. Eriksson. Certainly he was the pinnacle around which the Foxes rotated against Forest but, beyond that, he has started his season at his new club with bags of energy. His skill and ability are without question and in signing him Eriksson has secured a massive coup. On the evidence to date, Fernandes is going to be a big player for Leicester City this season. Is there still a striker issue? David Nugent would certainly say that it is not the case, and his appearances so far are going some way to support that view. One of the few bright sparks against Reading, Nugent put in a decent shift against Bristol City and was justly rewarded when he scored his first Leicester City goal against the Robins. He, again, was a crucial cog at the City Ground and he will hope to be adding to his tally against Southampton next week. At the moment, Nugent should be one of the first names on the team-sheet. On another day he might have bagged a third goal before half time to put the game at the City Ground beyond reach of Forest but his effort late in the first half was well saved by Lee Camp. Danns is already a hit amongst fans and is seemingly unflustered at being rotated alongside Yuki Abe and Andy King: he's currently the best-performing of this midfield trio. It was a very poor decision from this referee to award the penalty at the City Ground. 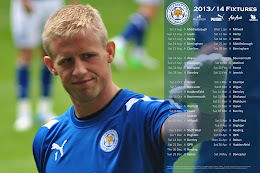 Even worse was not making it clear to a player (in this case Kasper Schmeichel) that he has been booked. Worst was in handing Schmeichel his second yellow card, for what can only be viewed from this footage taken from the stands as his throwing the ball back to restart play. Clearly this was not, as the BBC would have it, "a moment of madness as he hurled the ball into the crowd". Rather. a moment that happens routinely, each and every game, as a goalkeeper throws the ball back to the centre circle after a goal. Bizarre decisions indeed from a supposed elite level referee. A harsh handball decision that led to Forest's penalty that ended-up turning that game, but Matt Mills has not had the easiest of starts to his new life as a centre half at the King Power Stadium. He performed poorly against Reading and has not shone as yet, failing to make the immediate impact that many fans expected. He evidently needs time to adjust. Sean St Ledger, meanwhile, dallied far too long in possession and his slip allowed Nicky Maynard to give Bristol City a rather undeserved victory. For Eriksson to have invested millions in a new defence, conceding six goals after just four league games isn't exactly a great way to start a promotion campaign. From Leicester City megastar to Welsh nobody. The invisible man has started this season as he ended the last: as an anomaly. King is yet to unleash the talent he showed the Championship this time last year, perhaps hindered by Eriksson's new squad rotation system. That, or he is sandbagging (to use a motor racing term), waiting until the transfer window is closed. We hope. His mistake led to Forest's equaliser, as he leapt for a diagonalled cross he was never going to get near. Enjoying that new jersey? There are roadworks ongoing throughout the first half of the football season around Leicester that will affect journeys to and from the King Power Stadium. See our travel bulletin for more information. © Tim Nutt 2009-2013. All Rights Reserved. Powered by Blogger.